Becoming a member of a treaty after the original treaty has been signed. The Algonquian language is a subfamily of related First Nations languages, the speakers of which range widely across the northerly regions of what is now North America; stretching from the northeast coast west to the Rocky Mountains. Treaty 6 First Nations Algonquian speakers include such groups as the Cree and the Saulteaux. An act passed in 1850; it included the first definition of the term "Indian." The act specified that Indian status was linked to band membership. It became and offence to deal directly with Indians for their lands, trespassing on Indian lands was formally prohibited, and Indian lands were made exempt from taxation and seizure of debts. Passed in 1857, the Act applied to both Canadas (Lower and Upper) and was one of the most significant events in the development of Canadian Indian policy. The Act’s aim was to eventually remove all legal distinctions between Indians and non-Indians through the process of enfranchisement. Underlying the Act was the belief that it would be possible in time to fully absorb Aboriginal peoples into colonial society. This statute introduced the concept of local government to reserves. This sets a model for contemporary Aboriginal Self-Government and the original form prescribed in 1869 remains unchanged. Father André was a Roman Catholic missionary in Western Canada. He was born in 1832 in Kergompez, France, and after ordination was immediately sent to the Red River settlement and the Dakota Territory. Father André spent much time in service to people in Manitoba, Saskatchewan, and Alberta, especially the Métis population. As a result of his ties with the Métis, he was assigned as Louis Riel's spiritual advisor prior to his execution in 1885. Father André opposed the conviction of Big Bear after the Northwest Resistance. He died in Calgary in 1893. Adams George Archibald was born in 1814 in Truro, Nova Scotia, to a prominent political family. He became a lawyer, Liberal politician, and a father of Confederation. In the Nova Scotia legislature, Archibald did not always side with his own party, and eventually became a Liberal-Conservative. He supported provincial railway development, elected municipal governments, taxation for a state-run school system, and reciprocity with the United States, and he opposed any efforts to expand the province's electoral franchise. Following the Charlottetown Conference in 1864, Archibald was the only member of the Liberal caucus to support Nova Scotia's entry into Confederation. In 1870, Archibald gave a speech in favour of conciliation towards the leaders of the Red River Resistance in Manitoba. This was noticed by the Conservative leader George-Étienne Cartier, who asked Archibald to become the first Lieutenant Governor of Manitoba and the Northwest Territories. Archibald agreed on the condition that he be appointed to the Supreme Court of Nova Scotia. Thus, Archibald created Manitoba’s first government, pursuing a policy of conciliation with the province's Métis population, encouraging them to register their lands, and even meeting with Louis Riel. His real intentions were to prevent another Métis uprising, and to allow for the gradual hegemony of new Canadian settlers in the region. After serving his term, Archibald headed back east and was eventually appointed Lieutenant Governor of Nova Scotia. He died in 1892. The Assiniboine originally occupied territories in present-day northeastern Montana, southeastern Alberta, southern Saskatchewan, and southwestern Manitoba. It is believed that the Assiniboine people were once part of the larger Sioux nation, but broke away from the Sioux around the 17th century. A nomadic plains people, the Assiniboine lived a lifestyle centred upon the bison hunt. They became close allies with the Cree, trading with them for European-made goods and aiding the Cree in their war against the peoples of the Blackfoot Confederacy. Linguistically, the Assiniboine are related to the Nakoda (Stoney) peoples, but the Nakoda language and the Assiniboine language have enough differences between them that they are considered distinct languages. The process of absorbing or being absorbed by a group or system so that elements are the same. In Canada during the twentieth century, policies of assimilation – such as banning spiritual ceremonies like the potlatch, and forcing attendance at residential schools – attempted to fully absorb Aboriginal peoples into mainstream society. A widespread North American First Nations language family whose speakers range from the Arctic south to Mexico. Treaty 6 First Nations Athapaskan speakers include the Chipewyan or Dene people. A territorially-based group of one Aboriginal nation, often historically related by kinship; e.g., the Samson Band of the Cree Nation. Today, many bands prefer the term nation: the Samson Cree Nation. Each band has a governing council, usually with one or more chiefs and several councilors. The 614 bands identified under the Indian Act receive communal land and funding from the government. Peter Ballendine, sometimes spelt Ballenden or Ballendyne, was born in 1837 and worked for the Hudson’s Bay Company as an interpreter from 1860-1864 at Fort Pitt. He was then Clerk-in-Charge and Postmaster-in-Charge at Battle River (later named Battleford), and at Carlton from 1864 to 1874. He arrived at Battle River in 1876 and took up a homestead in Battleford, Saskatchewan. Ballendine was an interpreter for Treaty 6 at Fort Carlton and also in Battleford in 1878. He served as a member of the Battleford Home Guards during the Northwest Rebellion, and as a scout at the Battle of Cut Knife Hill. He died in 1885. After being thwarted at the Battle of Fish Creek on 24 April 1885, Major General Frederick Middleton and his force of 800 men, successfully attacked Batoche itself, on 9 May 1885. The fighting at Batoche lasted four days. The Métis, led by Louis Riel, were much smaller in number, only about 275, and quickly ran out of ammunition. They resorted to firing pebbles from their guns until they were forced to retreat. Riel was captured on 15 May, and hanged for treason; other rebel leaders were imprisoned or fled to various parts of Canada and the United States. The Northwest Resistance had been brought to an end. The Battle of Belly River was the final battle between the Cree and the Blackfoot for land control. It was fought in October of 1870, near Lethbridge in present-day Alberta. It was reported that between 200 and 300 Cree and 40 Blackfoot were killed. If these estimates are correct, Belly River was the largest battle fought on the Canadian plains between the First Nations. The Battle of Duck Lake was the Métis victory that signaled the beginning of the Northwest Resistance against the Dominion of Canada. On 26 March 1885, Louis Riel and military commander Gabriel Dumont defeated North West Mounted Police superintendent Leif Crozier and his mixed force of policemen and Prince Albert volunteers. The battle took place at Duck Lake, south of Prince Albert in present-day Saskatchewan. The Battle of Fish Creek was a major Métis victory in Louis Riel’s Northwest Resistance against the Dominion of Canada. It occurred on 24 April 24 1885, when military commander Gabriel Dumont defeated Major General Frederick Middleton by halting his advance on Batoche. More popularly known as “Custer’s Last Stand,” the battle was fought along the sloping ridges of the Little Bighorn River on 25 June 1876. Lakota Sioux and Cheyenne forces, under the leadership of Sitting Bull, were victorious and virtually annihilated Colonel George Armstrong Custer’s 7th United States Cavalry. A proposal to amend the Indian Act that parliament approved as law in 1985. This amendment decreased discrimination against women and increased First Nations control over their own affairs. It removed the section of the act that stripped women of their Indian status and rights – including the right to residence on a reserve – when they married non-First Nations men. As a result, more than 100,000 people – often referred to as Bill C-31 Indians – were able to have their status reinstated. The Blackfoot Nation really consists of four distinct Blackfoot nations who share a historical and cultural background but have separate leadership: the Siksika (which means Blackfoot), the Kainai (also called Bloods), the Piikani (Peigan), and the Blackfeet Nation (in the United States). In keeping with First Nations preferences, the term “Blackfoot” will be used to refer to the collective nations. The term came about in the mid-1700’s when the fur traders adopted it in reference to the Kainai, Piikani, and Siksika groups. The Blackfoot roamed the prairies between Saskatchewan and Missouri. They were expert horseback riders, excellent bison hunters, and fierce warriors. Today, there are three nations in Alberta and one tribe in Montana. The Canada-United States border was determined with the Treaty of Paris in 1783. The treaty ended the war between Great Britain and the colonies that wished to separate; these colonies would later form the United States. The Jay Treaty of 1794 created the International Boundary Commission, which was charged with surveying and mapping the exact boundary between Canada and the United States. Disputes over the interpretation of boundary demarcation have led to various treaties, including the Oregon Treaty of 1846, which established the 49th parallel as the border running through the Rocky Mountains. The CPR was originally constructed from eastern Canada and British Columbia between 1881 and 1885. The railway was to fulfill a promise made to British Columbia when it entered Confederation in 1871. The end of the Northwest Resistance pushed the government to support the completion of the railway line by providing the much needed funds. For two decades, the CPR was the only practical means of long distance passenger transport in most regions of Canada, and was instrumental in the settlement and development of Western Canada. Among the oldest of all Christian churches, the Roman Catholic Church and its beliefs came to North America and the First Nations peoples with explorers, traders, and settlers from France as early as the 1500s. From their earliest arrival, Roman Catholic clergy included in their overall mission of ministry, an effort to convert First Nations peoples to Christianity. The Catholic Church was present in modern-day Alberta as early as 1842, when Catholic Oblate missionary Father Jean-Baptiste Thibault established a mission at Fort Edmonton. Later, Thibault would establish a Catholic presence in Fort Pitt, the site of Treaty 6 negotiations in 1876. After Treaty 7 was signed in 1877, the Catholic Church and other Christian churches established residential schools. These schools, designed to assimilate First Nations peoples into European culture, had a significantly negative impact on the spiritual and social lives of generations of First Nations peoples. Another name for the Ojibwa people, Chippewa seems to be a somewhat skewed version of the word Ojibwa. Both Chippewa, and Ojibwa, in particular, Plains Ojibwa, have been used. The Chipewyan were originally a northern nomadic tribe who occupied land from the Churchill River north to the tundra and from Hudson Bay in the east to Great Slave Lake and part of Alberta in the west. The Chipewyan survived mostly by hunting caribou. They lived in temporary dwellings made of caribou hide. While they did use canoes they traveled extensively on foot, with the aid of snowshoes in winter, pulling their possessions on wooden toboggans. By the end of the 19th century, many Chipewyans lived in winter log cabins settlements and wore cloth clothing. After the arrival of Europeans in their territory, the Chipewyan population was devastated by smallpox which reportedly claimed about ninety percent of their peoples. The Chipewyan signed several treaties with the federal government between 1899 and 1921. 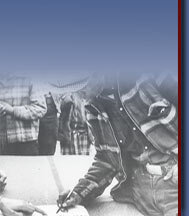 In 1988, the Chipewyans living in the Northwest Territories signed a new agreement with the government as part of the Dene Nation. Essentially, this act is a clarification of the 1857 Act for the Gradual Civilization of the Indian Tribes in the Canadas. It helped to further define the legal conditions under which Aboriginal people could be assimilated into non-Aboriginal society. Clarke was the last chief factor at Fort Carlton before moving to present-day Prince Albert, Saskatchewan, in the early 1880s. There, he was a prominent local citizen with connections to the Conservative Party of Canada. He is regarded by some as having contributed to the decay of Métis living conditions. In 1875, he tried Gabriel Dumont for fining a group of Métis who had begun to hunt bison before the official hunt. Some have also blamed him for inciting the Métis to violence in the 1885 Northwest Resistance by spreading false rumours of an impending government attack. Clarke was the first elected Member of the Legislative Assembly in the history of the Northwest Territories. Canada became a country in 1867 through The British North America Act, a law passed by the British Parliament. The Act federated the British colonies of northern North America into a country consisting of four provinces: New Brunswick, Nova Scotia, Ontario and Quebec; with two levels of government, federal and provincial. Responsibility for the welfare of Treaty Indians and the security of their lands was placed firmly in the hands of the federal government. In First Nations cultures, the Creator, also known as the Divine Father or the Great Spirit, is the basis of all life. His Spirit is present throughout all creation, which is governed by divine or natural law. The relationship between the Creator and what He created is understood to be similar to that between family members, and is thus governed by laws detailing the duties and responsibilities for each member of the family unit. As such, the First Nations believe in living in a harmonious and respectful manner with each other and with Mother Earth, who in turn will provide them with all the necessities of life. First Nations express their spirituality and their relationship with the Creator through different spiritual practices, stories, and cultural products. The Creator is referred to as Adaylua Wahkantanga in Nakoda; wiyohtawimaw; in Cree; and yedariyé in Dene. The Ojibway/Saulteaux term for “Great Spirit” is Kihci-Manitø. The Cree people of Canada built a nation that extended from the boreal forests of Quebec to the foothills of the Rocky Mountains. Two important facets of Cree life should be noted: the vast expanse of land that they have occupied historically to present and the various cultural subdivisions that have emerged through time. Over the years, the Crees, originally an Eastern Woodlands people (the James Bay Cree) have spread out; becoming, in turn, a Western Woodlands people (the Swampy Cree) a Parklands people (the Woods Cree), and a people with a Plains way of life (the Plains Cree). Cree is an Algonquian language comprised of five major dialects; Western/Plains Cree, Northern/Woodlands Cree, Central/Swampy Cree, Moose Cree, and Eastern Cree. The Crow are a First Nations people who today live on a reserve south of Billings, Montana. The sister tribe of the Crow is the Hidatsa. Some have traced the ancestral home of the Crow-Hidatsa to the head waters of the Upper Mississippi River in either northern Minnesota or Wisconsin. Others believe it to be in the southeastern Winnipeg area of Manitoba. They later moved to the Devil's Lake region of North Dakota, and the Crow then split from the Hidatsa and moved westward. The tribe was eventually split, creating the Mountain Crow and River Crow. Crowfoot was born in approximately 1830 into the Kainai (Blood) tribe of the Blackfoot Confederacy near Belly River, in present-day southern Alberta. He was adopted into the Siksika (Blackfoot) Nation when he was five years old and lived the rest of his days among them. Crowfoot fought as many as nineteen battles during the course of his life. Despite this, he strove for peace instead of warfare. Crowfoot signed Treaty 7 in 1877 and refused to join the Northwest Resistance. Succumbing to tuberculosis, he passed away on his reserve in 1890. One of three dialects spoken by the Nakoda People. Dakota tends to be a language spoken by those Nakoda living in what is now the United States (see Assiniboine, Lakota, Nakoda). The form of the modern Indian Act can be traced to this statute created in 1868. This Act appointed the Secretary of State, or the Superintendent General of Indian Affairs, to hold control and management of the lands and property of First Nations in Canada. At this stage, however, there is no power of self-government given to the First Nations. Born in 1835 in Devonshire, England, Edgar Dewdney was originally employed as a railway surveyor before becoming active in colonial politics. Dewdney was the Indian commissioner for the Northwest Territories from 1879-1888, and the sixth Lieutenant Governor of the Northwest Territories from 1881-88. He presided over the removal of the territorial capital from Battleford to Regina. A featureless location without water, trees or topography, Dewdney had secured substantial real estate for himself adjacent to the Canadian Pacific Railway line in Regina. He served as minister of the Interior and superintendent of Indian Affairs from 1888-1891, and as Lieutenant- Governor of the province of British Columbia from 1892-1897. He died in 1916. The son of famed English novelist Charles Dickens, Francis Jeffrey Dickens was born in London in 1844. After being educated in France and Germany, Dickens considered many careers including medicine, farming and journalism. He eventually joined the Bengal Mounted Police, and later joined Canada's North West Mounted Police. In 1885, he served as garrison commander during the Siege of Fort Pitt, escaping with his men to Battleford after six days of travel on the river. He resigned his commission in 1886 and passed away within the year. The Dominion of Canada was a commonly used term for Canada from the time of Confederation in 1867 until around the Second World War. Dominion refers to the name given to a state of the British Empire. Born in 1826, Lord Dufferin was a prominent member of Victorian society and one of the most successful diplomats of his time. In his youth, he was a popular figure in the court of Queen Victoria, and became well known to the public after publishing a best-selling account of his travels in the North Atlantic. He had a long career abroad, serving as the third Governor-General of Canada (1872–78), Ambassador to Russia (1879–81), Ambassador to Turkey (1881–82), Commissioner to Egypt (1882–83), Viceroy of India (1884–88), Ambassador to Italy (1888–91), and Ambassador to France (1891–96). He died in1902. Born in the Red River area in 1837 to Isidore Dumont, a Métis hunter, and Louise Laframboise. Dumont spoke six languages and was highly adept at the essential skills of the plains. In 1837 he was elected to the presidency of the St-Laurent commune and afterward continued to be a leader to the Métis people of the South Saskatchewan River. He commanded the forces during the North West Resistance of 1885. Enfranchisement was the process by which certain Aboriginal peoples could, under particular circumstances, be made citizens of Canada. Enfranchising involved the relinquishing of one’s Aboriginal status in exchange for permission to take part in activities that were granted to non-Aboriginal citizens freely. For example, Aboriginal Peoples could enfranchise if they wished to drink alcohol openly in public before 1951 or vote in federal elections before 1960. In effect, enfranchisement was simply another way for the government to assimilate Aboriginal Peoples into mainstream society. At certain times in Canadian history, it was even mandatory. An enfranchised man's wife and children would automatically be enfranchised with him regardless of their wishes. Bill C-31 made it possible for Enfranchised peoples to restore their Aboriginal status and band membership years after having lost them due to the strict rules of the Indian Act. Fine Day was the war chief of Poundmaker’s band of Plains Cree during the Northwest Resistance of 1885. He led the Battle of Cut Knife Hill and would have gone to Batoche to join the Métis had it not been for the Métis’ defeat. Poundmaker was not in favour of Fine Day’s militarism, but according to Plains Cree custom he had no control over his band once the warriors had assumed leadership. Carlton House, which came to be known as Fort Carlton, was established in 1795. Fort Carlton was a Hudson’s Bay Company fur trade pot from 1810 until 1885. The post was located on the Carlton Trail from Fort Garry, Manitoba to Fort Edmonton, Alberta. Lawrence Clarke served as its last chief factor. The fort was later used as the base for the North West Mounted Police in the Saskatchewan Valley region. It was the first location for the negotiation and signing of Treaty 6 in 1876. Fort Macleod was the post established in October 1874 by the North West Mounted Police (NWMP) under the command of Assistant Commissioner James Farquarson Macleod. The fort was originally built on an island in the Old Man River about forty-eight kilometres (thirty miles) west of the notorious American whiskey trading post, Fort Whoop-Up. The original fort remained as an NWMP post until 1883, when Macleod received official permission to build a new post on higher ground on the south banks of the Old Man River. This new post was completed in 1884, and was located about 3 miles west of the original post. Established in 1829, Fort Pitt was the major Hudson’s Bay Company trading post between Forts Edmonton and Carlton, located at a large bend in the North Saskatchewan River just east of the modern Alberta-Saskatchewan border. It was the second location for the negotiation and signing of Treaty 6 in 1876. Sir George Arthur French was born in 1841 in Roscommon, Ireland. Educated at the Royal Military Academy, he was commissioned in the Royal Artillery in 1860. In 1871, at the request of the Canadian government, he was sent to Canada as a military inspector. French was appointed to organize the Northwest Mounted Police on its creation in 1873, and the next year he led the force on its famous march to the foothills of the Rockies. After serving as the second Commissioner of the North West Mounted Police from 1873, he resigned in 1876 and returned to duty in the British Army, using the organizational skills he developed in Canada to establish local defence forces in India and Australia. He was knighted at his retirement in 1902, and spent many years guarding the crown jewels in London, where he died in 1921. Wandering Spirit (Kapapamahchakwew) led an uprising near Frog Lake, Alberta on 2 April 1885. Angry about what he felt were unfair treaties by the federal government and the dwindling bison population, Wandering Spirit, with Little Bad Man (Ayimisis), gathered all the white settlers into the local church where nine people were killed and three were taken captive. Big Bear took no part in these events, and tried to prevent bloodshed. Nevertheless, he was hunted by the soldiers and Mounties, and gave himself up at Fort Carlton in July 1885. He was convicted of treason and imprisoned for two years. Ill, and broken in spirit, he died shortly after his release. Chief Wandering Spirit was hanged at Battleford, November 27, 1885 for his role in the killings at Frog Lake. In 1841, the Geological Survey of Canada (GSC) was formed to perform a geological survey of the country. William Edmond Logan (Mount Logan was named after him) was interested in participating in this survey. Gaining recommendations from prominent English scientists, Logan was appointed the first GSC director in 1842. He went to Kingston, Ontario to compile the existing body of knowledge on Canada's geology, and established the GSC's headquarters in Montreal in 1843. Today, the GSC is responsible for developing Canada's natural resources and protecting the environment. The Great Coalition refers to the grand coalition of political parties that formed in the Province of Canada on 22 June 1864. It was formed to stop the political deadlock between Upper and Lower Canada, which had stemmed from the French and English continually voting against each other, making decision-making impossible. The formation of this coalition under Étienne-Paschal Taché and John A. Macdonald as joint premiers led directly to Confederation in 1867. The Order of Sisters of Charity of the Hôpital Général of Montreal, commonly called Grey Nuns of Montreal, is an order of Roman Catholic nuns. The order was founded in 1738 by the Venerable Marie-Marguerite Dufrost de Lajemmerais (Madame d'Youville) and the Rev. Louis M. Normand du Faradon. Madame d'Youville and three other women rented a small house, and began their order by receiving four or five poor people, whose number shortly rose to ten. In 1753 they received a royal sanction, and in 1755 the peculiar dress of the sisterhood was adopted by mutual consent and worn for the first time. They received Episcopal sanction in 1754. To this day, the Sisters pledge themselves to devote their lives to the service of suffering humanity. The first priest on Star Blanket (Ahtahkakoop)’s reserve, Hines was an unwavering and influential force in attempting to keep the people separated from their traditional culture. In 1919, he published The Red Indians of the Plains: Thirty Years' Missionary Experience in the Saskatchewan. The Hudson’s Bay Company (HBC) was a fur trading company established by British Royal Charter in 1670. This original charter and a later renewal of the charter gave the HBC jurisdiction over two vast areas in the Canadian interior: Rupert’s Land and the North-Western Territory. Rupert’s Land (named after Prince Rupert of England, who was the first governor for the company) covered what is now known as the provinces of Ontario and Quebec west of the Laurentian Mountains, the province of Manitoba, most of the province of Saskatchewan, the southern part of the province of Alberta, the eastern Nunavut Territory, and small northern portions of the states of North Dakota and Minnesota in the United States. The North-Western Territory covered lands to the north and west of Rupert’s Land. The Hudson’s Bay Company was the most powerful fur trading company at the time of the fur trade, with its major rivals being the North-West Company (which merged with the HBC in 1821), and the American Fur Company in the United States. HBC trade dominated early Canadian life, and affected First Nations peoples across the Dominion. As the HBC pushed west to explore new avenues of trade, First Nations peoples eventually came into contact with HBC traders; though trade goods from the HBC were circulating among the peoples for some time before any personal encounters took place. In 1870, the Canadian Government purchased Rupert’s Land and the North-Western Territory from the Hudson’s Bay Company to the tune of £ 300,000.00. This paved the way for Canadian development and settlement of the region, and the evolution of the treaty process that acquired lands from the First Nations peoples who were living there. Big Bear’s son Imasees was a leader at the Frog Lake Massacre and a participant in the Battle of Frenchman’s Butte and the Battle of Loon Lake. When the Northwest Resistance ended, he fled to the United States where he took the name of Little Bear and proved to be a strong and decisive leader. The original Indian Act was adopted in 1876, and has been periodically amended since that time, most recently in 1985. It is federal law, which to this day, gives the Minister of Indian Affairs a full range of powers over virtually every aspect of Aboriginal life in Canada. The primary purpose of passing the Indian Act was to assimilate the Aboriginal population into European-Canadian culture. The First Nations were not consulted in the development of the act. The act initiated significant changes to the way First Nation chiefs and councils could function, it defined who an “Indian” was, and introduced Indian agents. On the other hand, the Indian Act also formalized the federal government’s responsibility to Indians, such as the setting aside of reserve lands. Government officials who were non-Native and responsible for carrying out the terms of the Indian Act. This is the name used by historians to describe a series of wars waged against the American Indians, which resulted in the white conquest of what is now the United States. The wars, which ranged from colonial times to the "closing" of the American frontier in 1890, collectively resulted in the decimation, assimilation, and forced relocation of Native Americans onto reserves. The warfare was characterized by numerous atrocities on both sides. According to an 1894 census, the more than 40 Indian wars from 1775 to 1890 claimed the lives of some 45,000 Aboriginals and 19,000 white people. This rough estimate includes women and children, since noncombatants were often killed in frontier warfare. In American history books, the Indian Wars have often been treated as a relatively minor part of the military history of the United States. Only in the last few decades of the 20th century have a significant number of historians begun to include the First Nations perspective in their writings about the wars, emphasizing the impact of the wars on Native Americans and their cultures. Father Albert Lacombe was born in 1827 in Saint-Sulpice, Quebec. He studied to be a Roman Catholic priest and was ordained into the Missionary Oblates of St. Mary Immaculate in 1849. After his ordination, Lacombe moved west to begin his work. His path eventually led him to Edmonton in the Northwest Territories, in 1852. He founded a number of Catholic missions throughout the land that would become the Province of Alberta. Between the years 1865 to 1872, Father Lacombe began work among the Cree and Blackfoot First Nations, establishing missions among them and working to end the traditional hostilities between the two peoples. It was during this time that Lacombe developed a friendship with the Siksika (Blackfoot) Chief Crowfoot. Because of this relationship and his work among the Blackfoot, Lacombe was called upon to assist at the Treaty 7 negotiations in 1877, but he was unable to attend the meeting. He did later serve at the negotiations for Treaty 8. After the signing of Treaty 7, Lacombe continued to minister to the peoples of the southern plains, while also serving the interests of European settlers. In 1883, he convinced Siksika leaders to allow the Canadian Pacific Railway to build a line through Siksika territory. He also helped to convince Blackfoot leaders to stay out of the 1885 Northwest Resistance. Lacombe died at a hospice he had established for elderly people in Midnapore, Alberta, in 1916. One of three dialects spoken by the Nakoda People, the other two dialects being Dakota and Nakota (or Nakoda). As a general rule, the Lakota and Dakota dialects tend to be spoken by those Nakoda who live in the present-day United States. These southern Nakoda are known as the Sioux or Siouan Proper (see Assiniboine, Dakota, Nakoda). Lieutenant Governor of the North-West Territories from 1876–81; Indian Superintendent for the North-West Superintendency from 1877–78, and Indian Commissioner from 1879–88 and from 1898–1914. Demands for title to certain territories as legitimately owed to and deserved by Aboriginal peoples. Comprehensive land claims involve land not covered by treaties with Canada or the Crown, mostly in the north and in British Columbia; specific land claims involve land covered by treaties where the terms of the treaties have not been met or land has been removed over the years without consent. Big Bear’s son, who along with war chief Wandering Spirit (Kapapamahchakwew) led the Frog Lake Massacre in the Northwest Resistance of 1885. Lord Lorne was born in 1845, the eldest son of the Argyll line of Campbells. He held the courtesy title of Marquess of Lorne and in 1900 became the 9th Duke of Argyll. He was educated at Edinburgh Academy, Eton, St. Andrews and Cambridge, and represented Argyllshire as a Liberal Member of Parliament in the British House of Commons for ten years. Lord Lorne served as the fourth — and youngest — Governor General of Canada from 1878–1883. When his appointment was announced, there was great excitement throughout Canada. For the first time, Rideau Hall would have a royal resident, as Queen Victoria's fourth daughter, Princess Louise Caroline Alberta (after whom Lake Louise and Alberta are named) had married the marquess in 1871. He and Princess Louise made many lasting contributions to Canadian society especially in the arts and sciences. After leaving Canada, the marquess was governor and constable of Windsor Castle from 1892 to 1914, and he sat as MP for Manchester South from 1895 until 1900. He and Princess Louise lived at Kensington Palace until his death in 1914. George McDougall was born in 1821 in Kingston, Upper Canada, to a Highland Scottish family. He and his wife converted to Methodism, and McDougall was ordained as a missionary in 1854. In 1860, he was appointed to his first mission in Rossville, Manitoba (near Norway House), and was soon named chairman of the Western Methodist Missionary District. George established and oversaw missions in all of the Saskatchewan District, including the present-day provinces of Alberta, Saskatchewan and Manitoba, and was charged by the Dominion government to announce treaty plans to the First Nations peoples in the area. His daughter Eliza and son John, also a watchers, were witness to the Treaty 6 negotiations at Fort Pitt in 1876. While on a bison hunt in 1876, McDougall perished during a blizzard near present-day Calgary, Alberta. Sir John A. MacDonald was born in 1815 in Glasgow, Scotland, and emigrated to Canada as a young boy. After practicing law in Kingston, Ontario, Macdonald went into politics as a Conservative and during the 1860s championed Canadian Confederation. He was instrumental in securing passage of the British North America Act, and is considered the primary organizer of the Dominion of Canada, serving as its first Prime Minister from 1867-1873 and from 1878-1891. MacDonald also served as Superintendent General of Indian Affairs from 1878-1887, Minister of the Interior from 1878-1883, and Acting Superintendent General of Indian Affairs from 1888-1888. He died in 1891. Born in 1822 in Perth, Scotland, Mackenzie emigrated to Canada West (now Ontario) in 1842. When the Dominion of Canada was created in 1867, he was elected to the House of Commons, where he led the Liberal opposition. Mackenzie served as the first Liberal prime minister of Canada from 1873–1878. As prime minister, his efforts at renewed reciprocity with the United States failed to address economic concerns, and his government was defeated in 1878. He resigned as leader of the opposition but held a seat in Parliament until his death in 1892. This Act which became statute somewhere between 1857 and 1867, and declared the Commissioner of Crown Lands to be the Chief Superintendent of Indian Affairs. This position had the power to dispose of lands reserved for the First Nations which they had surrendered. Following this, Indian Affairs Administration was transferred from the Commissioner in 1867 to the Secretary of State. The Methodist Church was a Protestant Christian Church founded by John and Charles Wesley, among others, in the early 1700s. Originally, the Methodist Church began as a reform movement within the Anglican Church (or Church of England), but eventually split off from the main body of the Church to become its own entity. Methodist missionaries began their work in Canada as early as 1840, at the request of the Hudson’s Bay Company, to both steer HBC workers away from a perceived life of poor moral grounding and to see to the spiritual conditioning of Aboriginal peoples. Methodist missions were established deep in the Canadian interior, including one established in 1840 by Reverend Robert Rundle at Fort Edmonton. Methodist missions began to penetrate into present-day southern Alberta starting in 1873, when Reverend John McDougall, son of Reverend George McDougall, established a mission among the Nakoda (Stoney) People at Morley in 1873. In 1883, another Methodist mission was established by the missionary John McLean among the Kainai (Blood) people. McLean had been working and teaching among the Blackfoot Peoples since 1880. Like the Catholic Church and other Christian churches, the Methodists established churches and residential schools among the Aboriginal people with the intent of assimilating them into mainstream society. The blessings of such missions were mixed. While missionaries would often advocate for improvements of living conditions among the peoples they worked with, they also would view Aboriginal people as lacking in so-called civilized values, and would encourage them to abandon their traditional language and culture. The Constitution Act of 1982 recognizes Métis as one of the three Aboriginal Peoples (along with Inuit and First Nations peoples). Historically, the term Métis applied to the children of French fur traders and Plains Cree women, of English and Scottish traders and Dene women in the north, and Inuit and British in Newfoundland and Labrador. Today, the term is used broadly to describe people with mixed First Nations and European ancestry who identify themselves as Métis. Sir Frederick Dobson Middleton, born in 1825, was a British general noted for his service throughout the Empire and particularly in the Northwest Resistance. Middleton held the position of Head of the Canadian Militia between 1884 and 1890. Suffering a defeat at the Battle of Fish Creek, he nonetheless proved himself a capable commander upon defeating the Métis resistance at the Battle of Batoche in 1885. For his service in the war, Middleton was knighted by Queen Victoria and received a medal and the sum of $20,000. He died in 1898. Born in 1831 in what is now southwestern Ontario, David Mills was a Canadian politician, author, poet and jurist. He served as Minister of the Interior from 1876 to 1878, replacing David Laird in the Cabinet of Alexander Mackenzie. Mills penned The Present and Future Political Aspects of Canada in 1860 and The Blunders of the Dominion Government in connection with the North-West Territory in 1871. He was first elected to the Canadian House of Commons as a Liberal Member of Parliament in 1867. Sir Wilfred Laurier appointed Mills to the Canadian Senate after he lost his Commons seat in 1896, and appointed him to Cabinet as Minister of Justice and Leader of the Government in the Canadian Senate. Mills was appointed to the Supreme Court of Canada in 1902, and served on the Court for one year until his death in 1903. A person conducting charitable religious work in a designated territory, often in a foreign country, whose intent is to convert others to his or her particular religion. The people known as the Stoney, who separated from the Plains Assiniboine sometime before 1640 and moved westward with the Cree. The Nakoda speak Nakota, a northern dialect of the Dakota Sioux language. They refer to themselves as iyarhe Nakodabi or "Rocky Mountain Sioux". Meaning “speakers of the same language”, Ne-hiyawak was the name that the Cree gave to themselves in their own Algonquian dialect (see Cree, Plains Cree, Woodland Cree). A term created by the Indian Act that refers to a First Nations person who is not registered according to the act’s requirements and therefore does not qualify for the rights and benefits accorded to persons designated as Status Indians. Prior to the enactment of Bill C-31 in 1985, First Nations women who married non-status men automatically became non-Status Indians. The North West Mounted Police (NWMP) came into being on May 23, 1873 as per an official mandate by Sir John A. Macdonald, the first Prime Minister of Canada, with the intent of bringing law and order to (and asserting Canadian sovereignty over) the Northwest Territories (which then included modern day Alberta, Nunavut, and Saskatchewan). The NWMP’s early activities included containing the whiskey trade and enforcing agreements with the First Nations people. On 1 February 1920 the NWMP was renamed the Royal Canadian Mounted Police (RCMP), with responsibility for federal law enforcement in all provinces and territories. The Northwest Territories came into being in June of 1870, when the Hudson’s Bay Company transferred control of Rupert’s Land and the North-Western Territory to the government of Canada. The Canadian Government renamed the area the Northwest Territories, and then set about dealing with the challenge of encouraging development and settlement of the region, especially after the west coast Province of British Columbia joined Confederation in 1871. The Numbered treaties with the First nations peoples living in the Territories were meant to quickly transfer the title of land from the First Nations peoples to the British Crown, thus allowing for the young Dominion of Canada to build a railway, develop, and settle the region. The collective name for a series of treaties negotiated between First Nations peoples living in the Canadian interior and the British Crown. Eleven treaties in all were signed between 1871 and 1921 (James Bay Treaty 9 was signed in 1929 and 1930). All treaties signed placed the condition that the First Nations Peoples would surrender the title of their traditional lands to the British Crown in exchange for annual payments and supplies. Reserve lands were also set aside for the First Nations Peoples to live on. The numbered treaties covered much of the area of the Northwest Territories from the Province of Ontario west to what is now the Province of Alberta. An Algonquian-speaking people who trace their history back to the subarctic boreal forest woodlands of eastern Canada. The Ojibwa (also known by some as the Bunji, and others as the Chippewa) lived a hunting, gathering, trapping, and fishing lifestyle in the east before pushing west with the European fur trade. Some of the westward migrating Ojibwa pushed south onto the plains of what is now present-day Manitoba and Saskatchewan in Canada. These Ojibwa adopted a bison-hunting plains lifestyle, and became known as the Plains Ojibwa, or Saulteaux (see Anishinabeg, Plains Ojibwa, Saulteaux). Born in 1843, Sir William Dillon Otter was a professional Canadian soldier who became the first Canadian-born Chief of the General Staff, the head of the Canadian Army. On 2 May 1885, he led a Canadian force of more than 300 in the Battle of Cut Knife against Poundmaker's Cree warriors. Otter's tactics were ineffective against the defending warriors, forcing him to retreat. In 1890, Otter founded the Royal Canadian Military Institute as a body for "the promotion and fostering of military art, science and literature in Canada." In South Africa, Otter commanded what was considered by many British officers to be the best infantry battalion in the country. He became the first Canadian-born officer to command Canada's military in 1908, and in 1910 he retired. During the First World War, Otter came out of retirement to command operations for the internment of enemy nationals resident in Canada. He died in 1929. The Palliser Expedition was a British expedition that explored and surveyed the open prairies and rugged wilderness of western Canada from 1857 to 1860. The expedition was led by John Palliser, who presented his report to the British Parliament in 1863. A comprehensive map of the surveyed areas was published in 1865. Palliser's Triangle was first explored by this expedition and they reported back that this region was too arid for agriculture, a finding that was overruled by later officials much to the detriment of those who have tried to farm there. Historically, the Plains Cree were a cultural subdivision of the Cree that emerged as a distinct cultural group sometime in the late 1600s to early 1700s, when a group of Cree moved south from the boreal forest woodlands to adopt a bison-hunting plains lifestyle on the prairies. In their own language, the Plains Cree called themselves Ne-hiyawak, meaning “speakers of the same language” (see Cree, Nehiyawak, Woodland Cree). Another name for the Saulteaux people who lived on the plains of present-day Manitoba and Saskatchewan in Canada. In their own Algonquin language, the Plains Ojibwa called themselves Anishinabeg or “original people” (see Anishinabeg, Ojibwa, Saulteaux). Also known as the Red River Rebellion, the Resistance is comprised of the events surrounding the provisional government established by Métis leader Louis Riel in 1869 at the Red River Settlement, in what is now the province of Manitoba. The Resistance was the first crisis the new government faced following Confederation in 1867. The English-speaking governor of the settlement, William McDougall, was opposed by the French-speaking inhabitants, and before the land was officially transferred from the Hudson's Bay Company to the Dominion of Canada, McDougall had arranged that it be divided according to the square township system used in Ontario. But the Métis, led by Riel, prevented McDougall from entering the territory; created a provisional government and executed Thomas Scott, a member of a faction that had resisted them. Canada and the provisional government soon negotiated an agreement. In 1870, the Manitoba Act was passed, allowing the Red River settlement to enter Confederation as the province of Manitoba. The Act also incorporated some of Riel's demands, such as separate French schools for Métis children and protection of Catholicism. After the agreement was settled, Canada sent a military expedition to Manitoba to enforce federal authority. It was known as the Wolseley Expedition (or Red River Expedition) and consisted of Canadian Militia and British soldiers led by Colonel Garnet Wolseley. As the expedition headed west, outrage grew in Ontario over Scott's execution, and many Ontarians demanded that Wolseley's expedition be used to arrest Riel and suppress what they considered to be rebellion. Riel fled to Montana, and the arrival of the expedition marked the end of the Resistance. Parcels of land throughout Canada that were set aside and held in trust for the Aboriginal peoples of Canada after Confederation. Established in a series of Numbered Treaties and held in trust for the Aboriginal population by the government through the Department of Indian Affairs, these parcels of land were connected to official "Indian" status and rights. Born in the Red River Settlement in 1844. Louis Riel was a leader among the Métis people of the Northwest, a founding figure in the creation of the Province of Manitoba, and one of the leaders in the North West Resistance of May 1885. Riel was increasingly influenced by his belief that he was chosen to lead the Métis people during the Resistance. On May 15, shortly after the fall of Batoche, Riel surrendered to Canadian forces and was taken to Regina to stand trial for treason. On 1 August 1885, a jury found Riel guilty and the judge sentenced him to death. He was hanged in Regina on 16 November 1885. His execution was widely opposed in Quebec and had lasting political ramifications. A pair of Treaties made between representatives of the British Crown and the Ojibwa Peoples living on the lands around Great Lakes Huron and Superior. These treaties are named after William Benjamin Robinson, who negotiated the treaties in order to obtain Ojibwa land for the interests of mining. The Robinson Treaties, concluded and signed in September 1850, refined the process of treaty making with First Nations peoples and set the standard for the later numbered treaties by refining the reserve selection process and including clauses regarding mineral, hunting, and fishing rights. The RCMP was created as the North West Mounted Police (NWMP) on 23 May 1873 by Sir John A. Macdonald, the first Prime Minister of Canada, with the intent of bringing law and order to (and asserting Canadian sovereignty over) the North-West Territories. On 1 February 1920 the NWMP was renamed the Royal Canadian Mounted Police (RCMP), with responsibility for federal law enforcement in all provinces and territories. The Royal Proclamation of King George III established the constitutional foundation of British colonial Canada after the defeat of the French army in North America during the Seven Years’ War. An important clause in the Proclamation regarded the land rights of First Nations peoples, declaring that First Nations land could not be settled upon unless permission to do so was given by the British Crown, who was obligated to negotiate for the title of the land with First Nations leaders. The Ojibwa were originally from north of present-day Sault Ste Marie, Ontario. They were called Saulteaux by the French. They speak an Algonquin language closely related to Cree. The Ojibwa lived in lodgings covered in birchbark, and survived by hunting and fishing, traveling by canoe and snowshoe. It was the fur trade that initially pushed the Ojibwa West to the Plains of Saskatchewan. Siouan is a First Nations language family, the speakers of which covered a range stretching from present-day North Carolina and Virginia in the southeastern United States north to Manitoba, Saskatchewan, and Alberta in Canada. Treaty 6 First Nations Siouan speakers include the Nakoda or Assiniboine people. The Sioux are a First Nations people who live mainly in North Dakota, South Dakota, Montana, and Nebraska. They comprise the Santee (Eastern Sioux), Yankton, and Teton (Western Sioux), each of which in turn has lesser divisions. Their languages belong to the Siouan language stock. They call themselves Dakota, meaning “Friend,” the name Sioux being a French derivation of an Ojibwa name for “enemy” or “snake.” In the 17th century, the Sioux lived in the area around Lake Superior, but attacks from the Ojibwa drove them west into Minnesota. They adopted a Plains way of life, hunting buffalo, living in tepees, emphasizing valour in warfare, and practicing the Sun Dance. The Sioux supported the British in the American Revolution as well as — with the exception of one chief — in the War of 1812. The United States made treaties with the Sioux in 1815, 1825, and 1851. In 1862, a portion of the Sioux under Little Crow rose and massacred more than eight hundred settlers and soldiers in Minnesota. This revolt was suppressed, but unrest continued. In 1867 a treaty was concluded by which the Sioux gave up a large section of territory and agreed to retire to a reserve. But the discovery of gold in the Black Hills and the subsequent rush of prospectors brought resistance under the leadership of such chiefs as Sitting Bull (Tatanka Iyotanka). This uprising included the famous last stand by General George Armstrong Custer. The last major conflict fought by the Sioux was the battle of Wounded Knee in 1890, which resulted in the massacre of more than two hundred Sioux people. Sitting Bull was born in 1831 in present-day South Dakota. A Hunkpapa Lakota leader, he led a Lakota Sioux and Cheyenne victory in the 1876 Battle of Little Bighorn against Colonel Custer and the 7th U.S. Calvary. Pursued by American troops, Sitting Bull fled to Canada, but he returned to Montana in 1881 and surrendered. After two years in prison, he was an attraction for Buffalo Bill's Wild West Show, but left after a few months to live on a reserve in South Dakota. He died in 1890, when Lakota policemen were sent to arrest him to quell another uprising. Donald Alexander Smith was born in Scotland in 1820. Coming to Canada in 1838 a poor but well-educated young man, he became a fur trader, financier, and railroad builder. He was first hired by the Hudson's Bay Company, but came into public notice in 1869 when he was sent by the government to deal with Louis Riel’s Red River Resistance. Smith sat in the Dominion Parliament from 1871-1880 and from 1887-1896. He gained control of the Great Northern lines in 1878, and in 1885 was a leading force in the completion of the Canadian Pacific Railway, being the man to drive the last spike which completed the railroad. He was knighted in 1886, and made a baron in 1897. Out of the great fortune that he amassed, he gave large sums to charitable and educational enterprises. A highly controversial figure, Lord Strathcona was characterized by his enemies as a conniving self-seeker and by his admirers as a vigorous empire builder. He died in 1914, while in service as both the governor of the Hudson’s Bay Company and Canadian High Commissioner to England. A term created by the Indian Act that refers to a First Nations person who is registered according to the act’s requirements and therefore qualifies for the rights and benefits (e.g., housing; funding for post-secondary education) accorded to persons designated as Status Indians. Court decisions are beginning to make the distinction between Status and non-Status Indians less significant. Born in Purbrook, in present-day Ontario in 1849, Samuel Steele was a distinguished soldier and famous member of the North West Mounted Police. He participated in the Red River Expedition in 1870 to fight the Red River Resistance. Much to his disappointment, he arrived after the Métis had surrendered. In 1877, he was assigned to meet with Sitting Bull, who having defeated General Custer at Little Bighorn had moved with his people into Canada to escape American vengeance. Steele attempted to persuade Sitting Bull to return to the United States, but was unsuccessful. During the Northwest Resistance, Steele and his men missed the Battle of Batoche but defeated Big Bear's force at Loon Lake in the last battle ever fought on Canadian territory. The contributions of the NWMP to putting down the uprising went largely ignored and unrewarded, to Steele's great annoyance. The discovery of gold in the Klondike, Yukon in the late 1890s presented Steele with a new challenge. Steele and his force made the Klondike Gold Rush into one of the most orderly events of its kind in history and made NWMP famous around the world, which ensured its survival at a critical time when the force's dissolution was being debated in parliament. In 1900, Steele accepted an offer with the Canadian Pacific Railway tycoon Lord Strathcona to be the first commanding officer of Strathcona's privately-raised force: Lord Strathcona's Horse. The cavalry unit was sent to South Africa during the Second Boer War. Steele disliked what he was ordered to do by the British, which included burning towns and moving the populace into concentration camps. Steele requested active military duty with the outbreak of the First World War. He was initially rejected for command on the grounds of his age. However, a compromise was reached which allowed him to act as commander of the 2nd Canadian Division until the unit was sent to France, where he would be replaced. Steele accompanied the Division to England, where he took an administrative post and was knighted. He died of influenza in 1919, shortly after his seventieth birthday. In 1885, the Dominion government was faced with the problem of suppressing Louis Riel’s Northwest Resistance. Most of the newspapers wrote about the 5,000 troops organized in Ontario under General Frederick Middleton, but it was a small force of Alberta fighters, assembled by retired soldier Major General Strange, who ended the First Nations side of the uprising. Strange sought out the Northwest Mounted policeman he respected most, Superintendent Sam Steele, to take command of a NWMP unit that became known as "Steele's Scouts." Their victory at the Battle of Loon Lake brought an end to the resistance of Big Bear’s Plains Cree warriors. Another name for the Nakoda or Assiniboine people, particularly those who ranged in the eastern foothills of the Rocky Mountains in present-day southern Alberta The name Stoney seems to derive from the English translation of Assiniboine, which means “cooks with stones” (see Assiniboine, Nakoda). Born in 1831 in India to a British military family, Thomas Bland Strange was an army officer who served in Canada in the 19th century. Although he spent a decade serving and travelling in such places as Gibraltar, Jamaica, India, the Bahamas, Tibet, and Kashmir, Strange is most often noted for his service with the Canadian militia during the Northwest Resistance of 1885. Strange was a retired Major-General at the time of the uprising, and was raising cavalry horses near what is now Calgary, Alberta. At the outbreak of the violence, the government of Sir John A. Macdonald asked Strange to organize a field force for the District of Alberta. This force, consisting primarily of inexperienced militiamen and a few Northwest Mounted Policemen known as Steele’s Scouts, participated in the Battle of Frenchman's Butte against Big Bear’s Plains Cree warriors. Strange recognized the strength of the Cree position and refused to allow his inexperienced troops to attack. His professional caution undoubtedly saved many lives. In 1887, Strange sold his ranch and returned to England, where he lived for the rest of his life. He remained vigorous and active into the 1920s, publishing an article in the Canadian Defence Quarterly at the age of 93. He died one year later, in 1925. Strange was an outspoken racist and militarist. He played a significant role in imparting a sense of professionalism and technical competence to Canada’s first permanent military units. The Sun Dance is a religious ceremony that is practiced by many plains First Nations peoples, including the Cree, the Nakoda, and the Saulteaux. Commonly, the Sun Dance is held over four days, and involves a dance around a central pole erected in the middle of the campsite chosen for the event. The dance involves self-sacrificial acts, either by enduring the dance without water, or by attaching oneself to the pole by means of skewers attached to the pole that were pierced through one’s skin. Dancers pierced in this manner would attempt to tear out the skewers as they danced around the pole, their flesh an offering to the spirits in exchange for good fortune in the hunt, in warfare, or in some other major endeavour for the band. The Sweat Lodge Ceremony is a rite of spiritual purification in many First Nations cultures. In a traditional Sweat, a dome shaped, hide-covered Sweat Lodge is constructed. Stones are heated by a fire until they are red hot, they are then transferred to the centre of the floor of the Sweat Lodge. Participants gather in the Lodge, and offer prayers and gifts of sacrifice to the spirits. Water is poured on the hot stones and steam fills the lodge. Participants bathe in the steam, and sacred songs are sung and sacred prayers spoken for several rounds until the conclusion of the rite. Treaties were constructed by the British Crown to promote peaceful relations between First Nations and non-Aboriginal people. Over the next several centuries, treaties were signed to characterize, among other things, the respective rights of Aboriginal people and governments to use and enjoy lands that Aboriginal people traditionally occupied. There are four main categories of Indian treaties: Peace Treaties mainly in the Maritimes during the 18th century; simple land cession treaties in Upper Canada in the late 18th and early 19th centuries; Robinson treaties and the numbered treaties where large tracts of land were ceded or surrendered for cash, annuities, reserves, game rights and other benefits; and modern land claim agreements that are complex with governmental, social, and economic guarantees as well as large tracts of land. Courts, by applying the rules of statutory interpretation, see treaties as legislation. Signed in 1871 between Her Majesty the Queen and the Chippewa and Swampy Cree Tribes of Indians. Treaty 1 covers southern Manitoba. Signed in 1871 between Her Majesty the Queen and the Chippewa Tribe of Indians. Treaty 2 covers southeast Saskatchewan and southwest Manitoba. Signed in 1873 between Her Majesty the Queen and the Saulteaux Tribe of the Ojibwa Indians. Treaty 3 covers southwest Ontario and a small portion of southeast Manitoba. Signed in 1874 between Her Majesty the Queen and the Cree and Saulteaux Tribes of Indians. Treaty 4 covers most of southern Saskatchewan. Signed in 1875 between Her Majesty the Queen and Saulteaux and Swampy Cree Tribes of Indians. Treaty 5 covers central Manitoba. Signed in 1877 between Her Majesty the Queen and the Blackfeet. Treaty 7 covers southern Alberta. A treaty signed in 1899 between Her Majesty the Queen and the Cree, Beaver, Chipewyan, Dene, and Saulteaux Peoples living in the lands that would later become northern Alberta, northwestern Saskatchewan, northeastern British Columbia, and the southwest portion of the Northwest Territories. Treaty Indians are descendants of Indians who signed treaties with the Federal Government of Canada and who have a contemporary connection with a treaty band. In 1763, the Treaty of Paris ended the Seven Years’ War, including the French and Indian War. It was signed by Britain, Portugal, France and Spain. France renounced to Britain the mainland of North America east of the Mississippi, its conquests in India since 1749, and four West Indian islands. Britain restored to France four other West Indian islands and the West African colony of Gorée (Senegal). In return for recovering Havana and Manila, Spain ceded Florida to Britain and received Louisiana from the French. Like the Piikani (Peigan), Siksika (Blackfoot), and Kainai (Blood), the Tsuu T’ina (Sarcee) Nation belongs to the Blackfoot Confederacy, despite coming from a different linguistic group than the other three Nations. While they share with their prairie allies various cultural traditions, such as practicing the Sun Dance, the Tsuu T’ina maintained their distinct identity and Dene language. Linguistically they are closely related to the northern Alberta Chipewyan, Sekani, and Beaver Peoples, as the Tsuu T’ina tribe is originally from the Northern Boreal Forest region. Legend explains that due to a quarrel between two brothers, the Tsuu T’ina parted with their Northern family over 600 years ago and migrated to the southern region of Alberta. The Tsuu T’ina was a hunter-gatherer culture that relied on the wandering buffalo for sustenance. Their nomadic lifestyle changed drastically, however, with the signing of Treaty 7 in 1877; this treaty ushered in a new way of life that implemented living on the reserves. The Nation was relegated to Blackfoot Crossing, a reserve which is located by Gleichen, east of Calgary. The Tsuu T’ina Peoples were discontent at Blackfoot Crossing as they had to share the limited space with the Siksika and Kainai Peoples. Due to Chief Bull Head’s steadfast persistence, on 27 June 1883 the Tsuu T’ina was given their own reserve in the mountainous area of Fish (also known as Wolf) Creek, which is located southwest of Calgary. The White Paper was a 1969 policy paper put forth in Canada by the newly formed Liberal Government of Pierre Elliot Trudeau. The paper proposed to put an end to the collective rights and status of Aboriginal People as defined in treaties and to remove protection of reserve lands in favour of affording Aboriginal the same rights and privileges of all Canadians. The policy was widely criticized by Aboriginal people across Canada, and was eventually withdrawn. Woodland Cree is a broad term used to refer to the Cree who live in the subarctic boreal forest region stretching from the east coast to the rocky mountains of what is now Canada. Woodland Cree has been further subdivided into Moose Cree and Swampy Cree, depending on the region in which the Cree lived. Unlike the Plains Cree, who adopted a plains lifestyle after the late 1600s, the Woodland Cree remained in the parklands and boreal forest further north, maintaining a hunting, gathering, fishing and trapping means of subsistence (see Cree, Nehiyawak, Plains Cree). For more on the making of treaty 6, visit Peel’s Prairie Provinces.